Krishna Teja Reddy; ambitious, positive and hardworking engineering graduate is part of InFI’s first Open source applications development team, mentored for ZANEC and Crayon’d during first quarter of 2013. Krishna developed his expertise in PHP, MySQL and other open source languages and tools required to be a productive developer with the help of InFI mentors. Krishna’s software development skills and Open source application development expertise has earned him a position on ZANECs project team. He has already completed critical application enhancements since then and waiting for even more challenging assignments. InFI is confident Krishna will build expertise and software to the satisfaction of his teams. 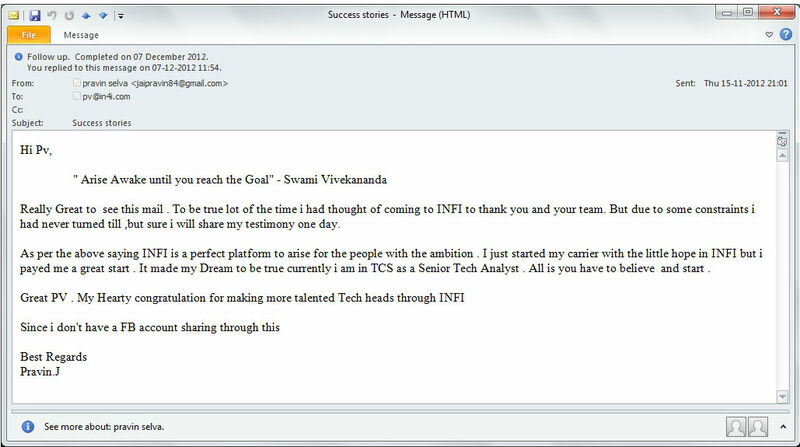 InFI wishes Teja a great career in IT industry. Krishna can be reached at krishna.mondeddu@gmail.com for further assistance to any fresher. Pravin Selva Kumar.J a perfectionist with analytic thinking is highly sought after professional as a systems support analyst. 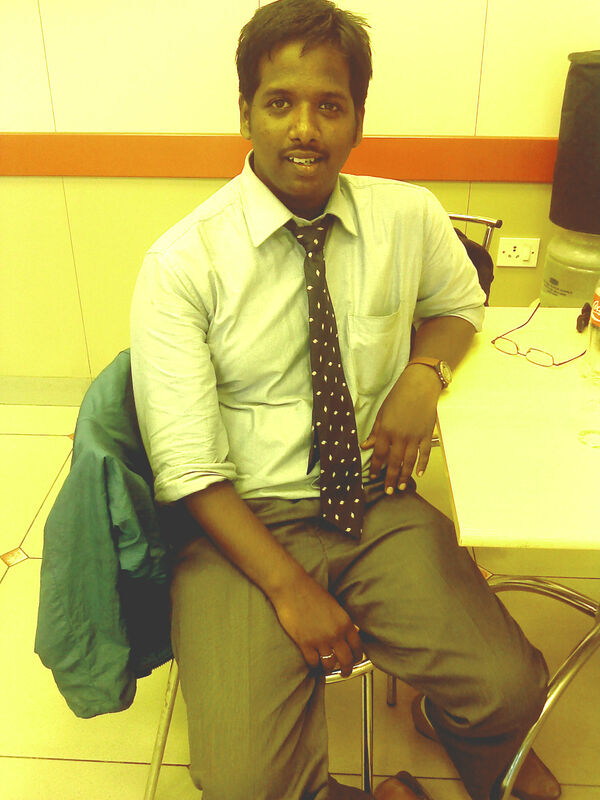 With IT academic skills and InFI’s mentoring he was groomed into a desktop support engineer in August 2010. He belongs to InFI’s 10th batch IT Infra-support engineer program. He has learnt, practiced and worked on Desktop H/W and Environment to build expert skills in troubleshooting and fixing issues. He joined Origin in Nov 2010 as Service desk analyst & Active directory support engineer following successful completion of InFI mentoring. 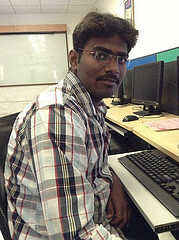 Pravin was deployed in TCS Eserve to support their desktop infrastructure in Chennai. 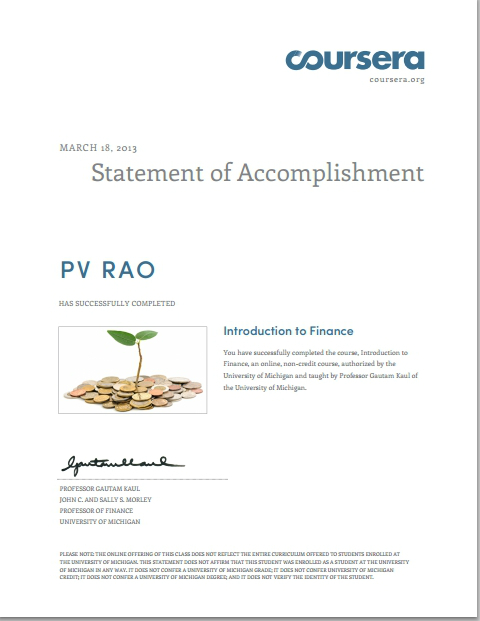 Pravin was promoted as Senior Technical Associate with higher responsibility by Eserve in March 2011. He is confident of reaching higher positions within the organization as his performance was recognized and rewarded for his IT Analyst role. Pravin is very strong in Microsoft Operating systems and Office suit. He has built expertise in ITIL for past few years and improved systems availability more than 99%. He can be reached at jaipravin84@gmail.com to discuss the experience at InFI and his success story. InFI Wishes Pravin a great career and happy life. We skill self and our teams, because knowledge is power.